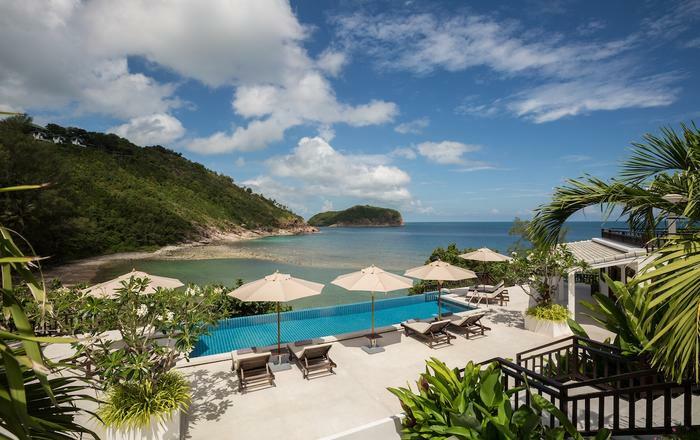 The first thing you'll notice are the sublime ocean views at this 5-bedroom Koh Samui villa (sleeps 10). 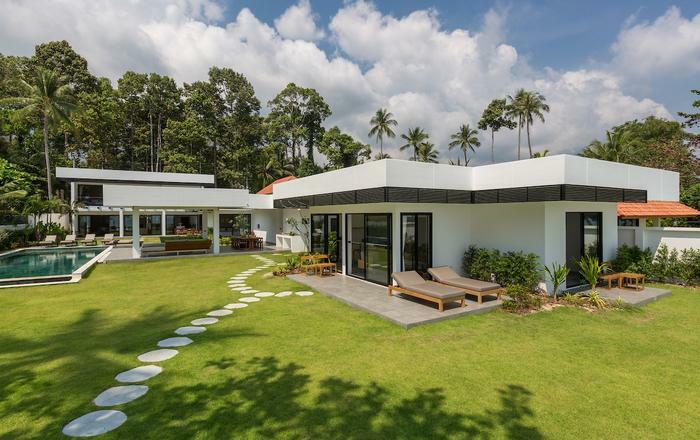 Minimalist design and impeccable attention to detail create a chic retreat that feels seriously chilled, yet super-luxurious. And a private pool, Jacuzzi, in-house chef, and quiet beachfront setting mean you'll never want to leave. 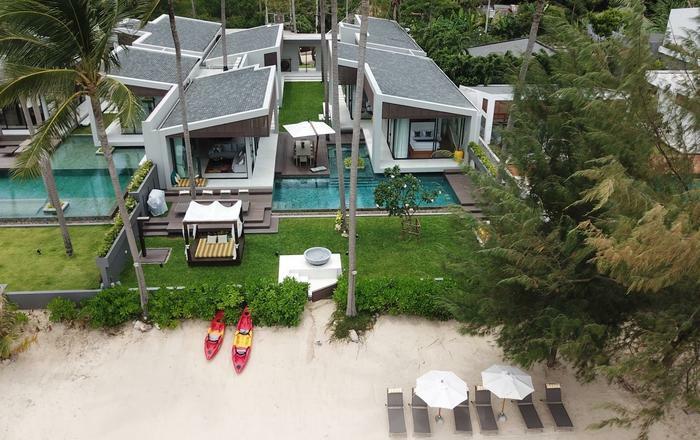 The villa is a short drive from numerous restaurants, the Four Seasons Hotel, and 5 minutes from Nathon - Samui's bustling capital town. Breathe in the scent of salt air as you flip-flop your way to the villa's private pool. Prepare to fall head over heels for the views - leaning palms and a golden beach sit before Samui's bath-warm waters. Head out for a morning jog, or feel at one with nature with a yoga session. Inside, bright artwork and tropical-themed pillows pop with color in an open-concept living/dining/kitchen area. Floor-to-ceiling glass doors feature on two sides, treating you to sigh-inducing views of the beach and ocean. 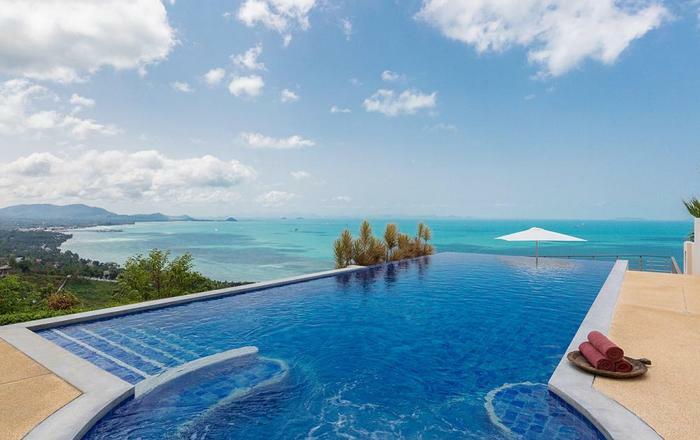 The villa is also perfectly positioned so you never miss Samui's dramatic sunrises and sunsets. These spectacular displays will stop you in your tracks. While the island's natural beauty takes center stage, the villa has plenty of entertainment to keep you occupied. Sprawl on the sectional sofa with live sports on the huge wall-mounted TV. Or hook up your playlist to the villa's sound system. With indoor and outdoor speakers, your holiday soundtrack follows you wherever you go. The villa also has one single and one double sea kayak. Paddle off from the shore and explore the island's luscious coastline. A fully fitted guest kitchen has its own breakfast bar, along with welcome extras, including a wine cooler, integrated coffee machine, and high-end German appliances. Not that you'll need to lift a finger to cook - your private chef can prepare sumptuous meals in the villa's commercial kitchen. Enjoy tasty snacks and end-of-day chats while your chef preps dinner. Feel like a personal Thai cooking class? Just ask your chef. They'll even take you to the daily markets where they select the freshest produce. Share sit-down meals around a large teak dining table, seating ten. Or enjoy the warmth and dish up outdoors - another table seats ten for al fresco dining. 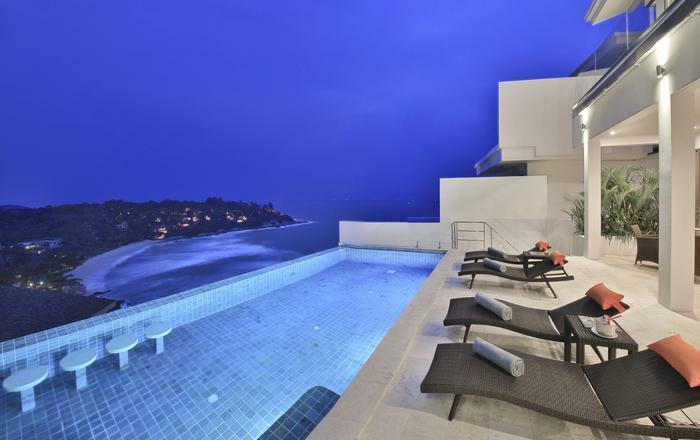 Coming nighttime, lapping waves create a soundtrack for relaxation in Villa Anar's five stylish bedrooms. Each has its own distinct style, with luxurious Jim Thompson fabrics, and bespoke artwork specially commissioned by Indonesian artists. Pick of the bunch is the master, which overlooks the ocean. Feel like a morning dip? Step directly from this bedroom into the swimming pool while your fellow guests slumber. The master also boasts a large en-suite bathroom with a shower, and an enticing terrazzo bathtub that's big enough for two to share a soak. All of the remaining bedrooms come with a king bed, and they're all just a step or two from the pool. 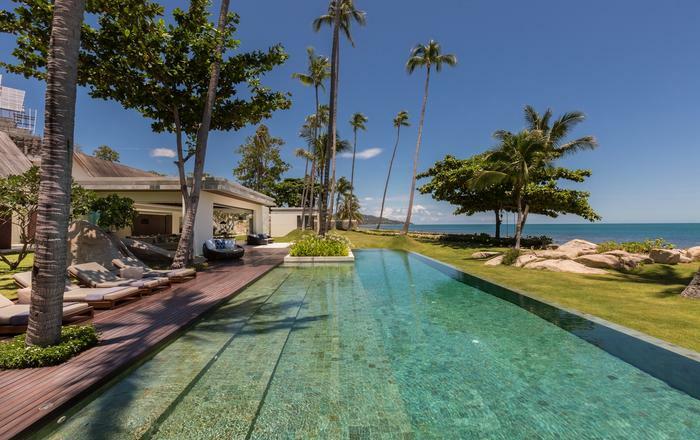 Villa Anar is tucked away on a quiet stretch of beach, but it’s just a short walk to the long stretch of the main section of Bang Por Beach. Here, you'll find over 20 restaurants serving local seafood, Thai regional specialities, and international cuisine. The 5-star Four Seasons Hotel is a couple of minutes' away and can also be reached by boat. The town of Nathon is only a 5-minute drive away, with plenty of restaurants, coffee houses, a supermarket, an array of shops, and a nightly food market on the seafront. Thank you for the best service! We had a wonderful vacation. We look forward to seeing you again. Thank you so much for an absolutely amazing stay. Our family booked this trip as a way to relax and reconnect as a family and to have three generations of our family experience Thailand together. Your team made this portion of out trip a true highlight. There was never anything that your team could not provide or handle. We also appreciated all of the little extra care and thoughtfulness you showed us with flowers and bandages! All of the food was absolutely amazing and we quickly learned that eating at home with a beautiful table of food in a wonderful setting would always top any restaurant. We also really appreciated how flexible your team was with our lazy schedule and our many last minute decisions. It was a true vacation for all of us! Thank you so much for an amazing stay. We have had such a fabulous time in this incredible villa. Joy and Benz have been absolutely wonderful. Outstanding food, all out service, especially helping our children - they will al miss you.